With several seas of rainwater collected, thousands of walls saved from humidity and, most of all, millions of dollars saved by our clients, Primeau Métal Inc. has set the industry standard for more than 60 years. Proud of both our mission and our history, we work hard to ensure we provide the best in rain gutter solutions for the residential and commercial sectors, as well as a wide range of custom options for a wide range of needs. We have the machineries, we have the materials, we have the knowledge and we have the experience. We have a qualified and professional team that invests time and passion to achieve the highest results. You will never have to choose between comfort and design, budget or durability. With us, you will have them all. And your home will thank you for your choice. Tinsmiths by trade, the Primeau family employs highly sophisticated machinery allowing it to freely shape steel, copper and other hard metals. We are one of very few manufacturers who produce Galvalume® steel eavestroughs. 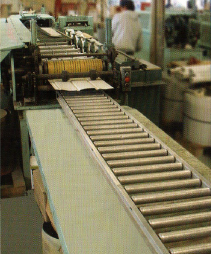 Our products undergo extensive testing for durability in order to meet systematic standards of excellence. 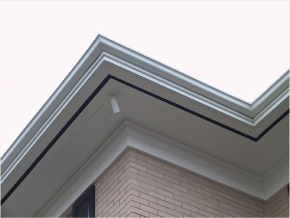 We offer you an extensive choice of eavestroughs, gutter solutions, and accessories that fit a wide range of needs. Hi-Bak® and J-Style® eavestroughs, leaf screens, Primair® soffits and fascias, all products with a proven track record. These products also come in a wide range of colours. In addition to our products, we offer all the necessary features to justify your investment before and after the installation. Great professionals! They came on time, they did a perfect job and the quality of their products is amazing! Owning several buildings in Canada is not an easy job, especially in spring. However, since Primeau mounted their rain gutters, everything changed. Thank you! My house is relatively old and when I had to change the rain gutters, I feared they would not match the original architecture. But these guys have everything!